With the start of 2016, it is now illegal to have both earbuds in your ears or to have both ears covered while riding a bike or driving. SAN FRANCISCO (KGO) -- Count them -- there are 807 new laws that took effect on Jan. 1 in California. They include an increase in the minimum wage from $9 to $10 an hour. Vaccinations are now mandatory for all K-12 students with no more personal beliefs exemptions. And it is now illegal to wear earbuds or earplugs in both of your ears while driving or cycling. It has been illegal in California to wear over-the-ear headphones for quite a while now, but legislators have tweaked this law to now include the very popular earbuds. You cannot wear both earbuds while riding your bike or driving your car; you must leave one ear open. We spotted one bicyclist on Market Street who was wearing both earbuds and quickly fessed up to the mistake. "This is wrong kids, don't do that, don't put two headphones in," bike messenger Victoria Lowry said. Lowry was delivering meals to a nearby shelter and has been a bike messenger for years. Lowry agreed with the law explaining, "It's kind of crazy. I mean, there's a lot going on. You have pedestrians, you people on bikes, the cars." More than 800 news laws went into effect on New Years Day in California. The new laws range from cheerleading to hoverboards to some hot-button issues like vaccines ans gun control. 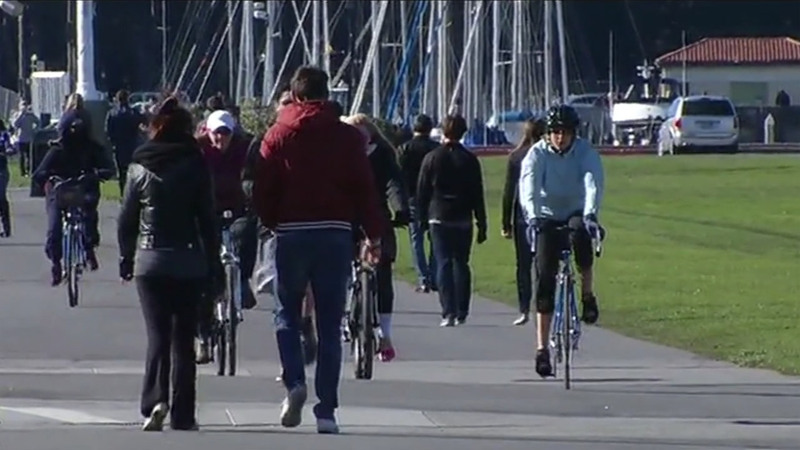 We also talked with two tourists from Rome, Italy who have enjoyed bicycling around San Francisco on Friday. Tourist Jane Brunore said, "I always use, wear just one, on low volume because I can hear some music while riding, but not that loud, so I can hear people talking." Wearing just one ear bud is legal. Police and traffic safety experts say having one ear free allows riders to be tuned into the traffic around just enough to be safe, but not every bicyclist agrees. "It's a very unbalanced feeling to do that. It's like listening to two different conversations," bicycle messenger Cirrus Wood said. The new law also affects motor vehicle drivers with only a few exceptions for industrial vehicles like garbage trucks and loud construction equipment. California is one of 13 states in the union that has some kind of restriction on earplugs, earphones, or earbuds. Four states have complete bans. As of New Year's Day, drivers and bicyclists can be cited for wearing two buds or earphones and could face a fine and court costs.